as the old woman did her lost spectacles - safe on her own nose all the time. If you try to surrender just a little bit to God, He’ll know. most unsatisfying and practically useless. take care to correct in yourself. Always put off until tomorrow what you shouldn’t do at all. When you’re depressed, it makes a lot of difference how you stand. because then you’ll start to feel better. 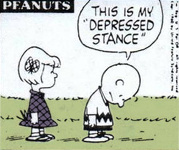 If you’re going to get any joy out of being depressed, you’ve got to stand like this. Hold on for the next supply.